If you are a member of SaddleBrooke Computer Club: Login to register for classes and access additional Website features. The SaddleBrooke Computer Club began in 1993 with three men sharing coffee and conversation in the RoadRunner grill. Occasional meetings became weekly; these eventually became weekly presentations with a single computer in space shared with the sewing club. Membership fees provided the first few computers set up on loaned folding tables. By 1998 we had become a non-profit corporation for the purposes of (1) promoting the use of computers for the senior citizens of SaddleBrooke Resort Community, (2) teaching classes on the use of computers, and (3) holding seminars on various topics as they relate to computers. We were granted continuing use of the Silicon Room in the MountainView Arts and Crafts Center by the homeowners association that same year. Since those modest beginnings, nearly 3300 SaddleBrooke residents are or have been members of the computer club. 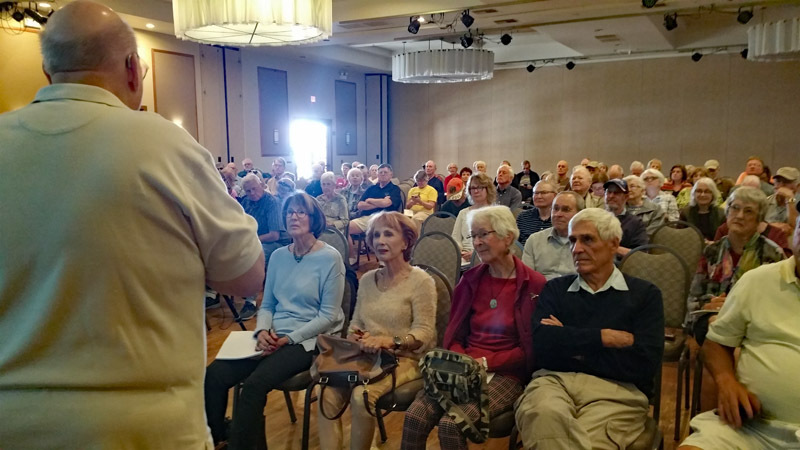 During the “snowbird season” the room is in nearly continuous use from 8:30 AM to 5:00 PM Monday through Friday. Last year we offered 145 different classes at multiple skill levels and accommodated 406 active members – but we still have room for more! Classroom equipment, instruction, and operating expenses have all been provided by club members through a combination of initial membership fees, annual class fees, donated items, and volunteer labor. Some students bring their personal laptop computers to class in order to participate. Club Membership is required for enrollment in our courses. As a SaddleBrooke community club, membership is restricted to SaddleBrooke residents and their guests. Initial membership includes all courses available for the calendar year on a first enrolled, first served basis. After the initial year, a small annual course fee applies for additional courses. Full details and costs are available in our FAQ - Membership Questions area of this Website. As you might expect, enrollment for our courses is an automated, on-line process. First login to the member Website with your club username and password. Then, go to the Class Calendar and click on the class you wish to take to start the process. When the class description appears, read it to make sure you meet the prerequisites for the class. To complete your registration, click the "Register Now" button on the right.